Introduction: Is it Wise to Focus Solely on the Economy? "Even though a state may be vast, those who love warfare will inevitably perish." This is an East Asian proverb that Admiral Isoroku Yamamoto often wrote in calligraphy. Leading up to the Second World War, Japan was the only country in Asia to possess modernized armed forces, invariably allowing it to win any battle it chose to fight. Emboldened by such victories, from the Manchurian Incident of 1931 onwards, Japan became a warring country. The result, as foreshadowed in that East Asian proverb, was devastation for the nation in 1945. Having learned a bitter lesson, Japan, in the postwar years, sought to achieve its rebirth through peaceful development focused on economic growth, a policy at which it excelled. The "Japanese miracle" of high-speed growth during the 1960s enabled Japan to eventually catch up and ultimately overtake the economies of Western Europe in GNP terms. While economic growth is important, is it wise to focus solely on the economy? "States comprise systems of power, systems of interests, and systems of values," said international politics scholar Masataka Kosaka. Should Japan, having achieved economic recovery, now seek to possess full-fledged military capabilities? No, it does not ever want to repeat the mistakes of the last world war again. Then, should Japan rather focus its attention on adding cultural value to its economic might? The establishment of the Japan Foundation in 1972 was the response to the questions Japan was asking of itself at the time. The three actors instrumental in the creation of the Japan Foundation were the Ministry of Foreign Affairs (MOFA), the Prime Minister's Office, and then Foreign Minister Takeo Fukuda. At MOFA, the Cultural Activities Bureau took the initiative in this matter. Looking back on the postwar period, the ministry came to understand that the United States government provided support to a broad array of programs and institutions such as the Government Appropriation for Relief in Occupied Areas (GARIOA) and the Economic Rehabilitation in Occupied Area (EROA) funds in the immediate postwar years, the Fulbright Exchange Program, as well as activities of private foundations such as the Rockefeller and Ford Foundations. Having achieved a sufficient level of economic growth, Japan now felt it was necessary to create similar types of funding mechanisms. Initially MOFA was unable to persuade the financial authorities to create such mechanisms. Then the Nixon shock occurred. As a result, MOFA became acutely aware of a lack of mutual understanding between Japan and the United States which, in turn, led to the submission of the August 1971 proposal, formulated under the leadership of Takaaki Kagawa, director of the Cultural Activities Bureau, for the establishment of the "U.S.-Japan Culture Center" that would be jointly funded by both countries, with Japan contributing 10 billion yen. (Ayako Kusunoki "Kokusai Koryu Kikin no Setsuritsu" [Establishment of the Japan Foundation], ed. Fumio Fukunaga, Daini no "Sengo" no Keisei Katei [Japan's Postwar History Revisited], Yuhikaku, 2015). While the pervading image of Mr. Fukuda is that of a "hawk" who had succeeded to the leadership of the Nobusuke Kishi party faction, his speech "Japan as a Peaceful Great Power" showed a more nuanced side. Fukuda's vision for Japan was not to become a military power backed by its strength as an economic power, but rather for it to play a peaceful and constructive role based on the dual policies of providing aid to developing nations and expanding cultural exchanges. In fact, Fukuda was acutely aware of the deep-rooted perception gap between Japan and the United States and recognized the urgent need to promote mutual understanding through cultural exchange. As a result, he took the lead in creating a foundation from a base of 50 billion yen; in time, expecting the fund would expand to 100 billion yen. In October 1972, the Japan Foundation was established with Hidemi Kon serving as the first president. The Japan Foundation was a new organization born during the final stages of Japan's high growth period. The oil crisis of 1973, however, resulted in a precipitous decline in the Japanese economy, all but extinguishing any hope for the infusion of new funds or the creation of other organizations. During the depths of the oil crisis, the Japanese rediscovered their national propensity for cooperation and hard work. This characteristic, in conjunction with technological innovations in home appliances, high performance and fuel-efficient compact vehicle engines, as well as other products, helped the Japanese economy recover by the end of the 1970s. By the 1980s, Japan had established overwhelming industrial competitiveness over the United States and Europe, and although this would intensify economic frictions, Japan's position and prosperity as an economic power was solidified. It was in the final stages of this period of prosperity that the Japan Foundation Center for Global Partnership would come into being. In November 1987, the new administration of Prime Minister Noboru Takeshita announced the "International Cooperation Initiative," as proposed by MOFA. This initiative was comprised of three pillars: (1) enhance Official Development Assistance (ODA), (2) strengthen international cultural exchanges, and (3) cooperate and participate in international peacekeeping efforts. These policies would become the fundamental pillars of Japan's post-Cold War era diplomacy. By this time, Japan's ODA had already been enhanced and expanded, and between 1989 and 1990, Japan became the world's top ODA donor. In 1992, following the entry into force of the Act on Cooperation with United Nations Peacekeeping Operations and Other Operations (PKO Act), which gave official approval for Japan's Self-Defense Forces (SDF) to engage in international operations, the SDF was first dispatched to Cambodia and then to regions around the world to participate in post-conflict peacebuilding and nation-building efforts. President George H.W. Bush and others in the United States immediately expressed support for this initiative. The proposal garnered additional importance both within the ruling party and outside, as Abe was considered a prospective prime minister. This support, however, would become merely a parting gift as Mr. Abe, due to illness, departed from the political scene before obtaining the premiership. It was decided that the Japanese name for the new organization would be, Kokusai Koryu Kikin Nichi-Bei Senta (Japan Foundation Japan-U.S. Center); the English name would be "the Japan Foundation Center for Global Partnership" (CGP), in accordance with the themes of the speech Abe had given in Washington D.C. With the end of Cold War and the advent of a multipolar era fraught with difficulties, the objective of CGP was not merely to enhance Japan-U.S. exchange, but to promote collaboration between Japan and the United States to address challenges that would improve the welfare of a globalizing world. It was determined that CGP would focus on "grassroots exchanges," engaging and involving local communities and civil groups and "intellectual exchange" to support academic research and promote joint research on policy-oriented issues as well as nurture public intellectuals with a sense of responsibility to society and civilization. 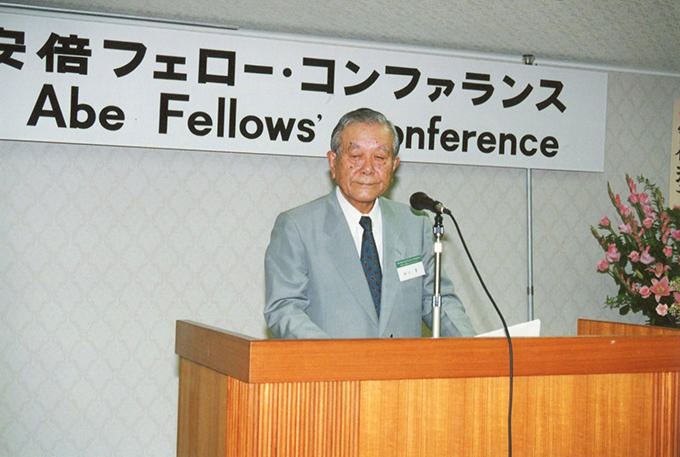 Under the auspices of "intellectual exchange" and to further support and nurture academics and practitioners, the "Abe Fellowship," was created and named in memory of the late Shintaro Abe, to provide support for up to two years of study and training overseas. To ensure the credibility and legitimacy of the selection process of Abe Fellows, a joint selection structure was established in collaboration with the Social Science Research Council (SSRC) of the United States and other organizations. An Advisory Committee to discuss the direction of CGP activities was also created. This AC was comprised of representatives from various sectors of society in both countries. The committee met twice a year--once in each country. Although I was not a committee member at the time of CGP's establishment, I joined in around 1995, just as Nagayo Honma took over the Executive Director post from Mr. Kusuda. All members were respected and distinguished in their respective fields, including those from political, financial and academic circles, who were joined by representatives from the diplomatic and media fields. Representatives of civil society, including Tadashi Yamamoto from Japan and Susan Berresford (Ford Foundation) from the United States engaged in lively discussions. 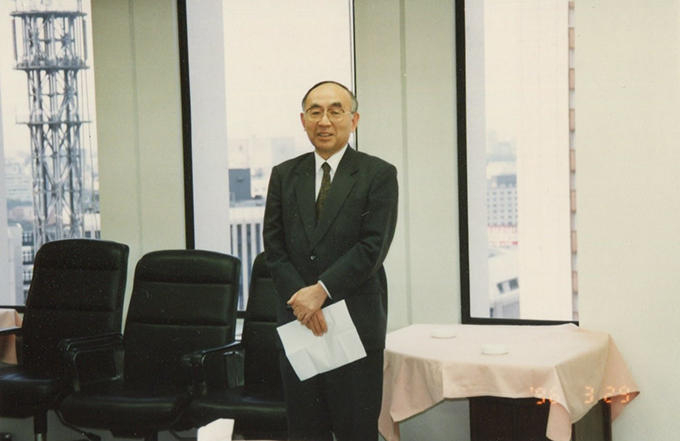 Executive Director Nagayo Honma, who took over the leadership of CGP from the first executive director, Minoru Kusuda. Prior to becoming executive director Mr. Honma served on the Advisory Committee for CGP. As alluded to earlier, immediately after the establishment of the CGP, in April 1991, as an organization fully funded by the Japanese government, the Japanese economic bubble burst, precipitating Japan's plunge into what became known as the "lost decades." This was an era in which low interest rates persisted and financial resources became increasingly tight. An even more difficult problem, and one that was a cause of concern for both Mr. Abe and Mr. Obuchi, was whether a government-funded and operated organization focusing on international exchanges could maintain its independence while conducting original and inventive activities. When government agencies with regulatory authority implement programs with public money, they must consider that they have a responsibility to manage how and for what purposes the money is used. However, any intellectual or cultural activities that are driven in a top-down manner are doomed to wither and lose vitality. In the academic and cultural fields, we cannot achieve original or thought-provoking outcomes unless autonomy and independence are respected. Even when the sponsoring agency is a national government, a spirit of tolerance is essential when selecting people to engage in activities and leaving them to their own devices based on basic ground rules. This vision was shared among all members of the Advisory Committee for CGP. The committee members from the United States focused, above all, on ensuring independence from authority. This focus represented both an expression of the spiritual traditions of the United States, since the time of the American Revolution, as well as the civility in a mature, developed society. On the other hand, among government agencies in Japan there was, as noted above, a strong sense of managerial responsibility as the regulatory authority and this caused friction from time to time, including conflicting opinions on the appointment of a successor to Executive Director Kusuda. Further, projects that focused on history issues also became politicized. After experiencing a number of up and downs, ten years after the establishment of the Advisory Committee for CGP, it was abolished. Although the demise of the Advisory Committee was unfortunate, overall, the activities of the Japan Foundation and CGP continue to play a major role in promoting cross-cultural exchange. These activities are truly significant for the role they serve in nurturing cultural exchange between Japan and the world; Asia, Europe and North America. The Japan Foundation continues to support Japanese-language teaching and Japan-related research around the world. In the area of intellectual exchange, the Abe Fellowship continues to produce consistently good outcomes through its joint operation by Japan and the United States. Similarly, the Research Institute for Peace and Security (RIPS) fellowship program, which is supported by CGP, is nurturing many internationally-oriented researchers. Other projects supported by the Japan Foundation, including exchanges among the young people of Japan, China and the Republic of Korea, also offers a beacon of hope for the future of the Northeast Asian region. It is indisputable that Japan recreated itself as an economic powerhouse in the postwar years. However, it cannot be accused of being a country that was unduly devoted to all things economic, or that it was merely an "economic animal." It is true that Japan bears an exceptionally low military burden among all developed countries. However, postwar Japan has concentrated its efforts into assisting developing nations through ODA and for more than 50 years Japan Overseas Cooperation Volunteers (JOCV) have been sent to communities in developing countries where they have toiled together with local people in a wide range of activities. What is more, through the establishment of the Japan Foundation in 1972, which was supplemented by CGP in 1991, Japan has endeavored to promote cross-cultural intellectual and cultural exchange and enhance mutual understanding. Although postwar Japan's "systems of power" may have been limited, instead Japan focused on "systems of interests" to which it added its own unique "systems of values." Although it would be difficult to say that enough has been done, great efforts have nonetheless been made and further expansion is anticipated in the future. Japan's descent into resolute devotion to militarism in the prewar period seemed at one point in danger of being translated into unquestioning devotion to the economy in the postwar period. This has not been the case. And in the midst of a turbulent world, let us hope that Japan will never forget the importance of intellectual and cultural activities that have the inherent power to overcome the spiritual poverty that springs from absolute devotion and create a rich and spiritually rewarding society. Makoto Iokibe was born in Hyogo Prefecture in 1943. He received his Master's degree from the Graduate School of Kyoto University in 1969. After working as an assistant, instructor, and subsequently associate professor at the School of Politics and Economics (currently the School of Law) of Hiroshima University, he became professor at the Graduate School of Law of Kobe University and president of the National Defense Academy of Japan. He has also served as a visiting fellow at both Harvard University and the University of London, and as president of the Japanese Political Science Association. Following the Great East Japan Earthquake of 2011, he was appointed as chair of the Japanese government's Reconstruction Design Council. He currently serves as chancellor of the Prefectural University of Kumamoto, professor emeritus of Kobe University, chair of the Kumamoto Recovery and Reconstruction Experts Meeting and president of the Hyogo Earthquake Memorial 21st Century Research Institute. His many published works include Beikoku no Nihon Senryo Seisaku [The U.S. Occupation Policy for Japan] (Chuokoron-sha) and Daisaigai no Jidai [Era of Great Disasters] (Mainichi Shimbun Publishing). He specializes in Japanese political and diplomatic history.